This post is wordless, but that doesn’t mean you don’t have thoughts to share. What do you think of the couple’s expressions? Postures? Do you have a similar photo in a family album? I have a few old family photos. I’ll take your word for it. It’s hard to see resemblances in one’s own family line. Thanks for being the early bird this morning, Merril! Apparently, among other reasons, they wanted a timeless record of how their appearance. Interesting article Marian! Thanks for sharing. It´s funny how the men were always sitting on those pictures while the women stood.Although I think Fannie is kneeling on this one as I don´t see her legs. I do have a feeling they are finding this very amusing. Love these old pictures and we have some as well. Yes, my grandmother is kneeling. I can’t imagine a bride today agreeing to assume this posture behind her new husband. I suppose the man behind the camera – probably under a black hood – made the suggestion. Poor Grandma. She’s kneeling and trying hard not to tip over. Woman subservient to man? Wedding dress too short or not pretty enough to show? Grandma taller than Grandpa? (Think she was!) Bottom line – Best Grandparents ever because they are mine. You have a keen eye, Jean. I would say Yes to your first question. Perhaps, the woman then thought of as an ornament, duty bound. We know her outfits before marriage rivaled the Downton Abbey crowd, so I’m guessing the dress was beautiful. Yes, I agree: “Best Grandparents ever because they are mine” too. With winter approaching, you might take a peek inside those old boxes. No telling what you would find, Susan. I’m glad you find the photo charming. It definitely requires a second look, removed as it is from current culture. What a wonderful picture. It’s obvious they were eager to start their life together. I can see love, excitement, and a bit of unease in their expressions; all appropriate on such an important day. Did they take a honeymoon before settling down? I think I see the love in their eyes only, not in their frozen expressions. I have no idea about a honeymoon, Lynn. It never occurred to me to ask Grandma. (Grandpa died when I was five.) My parents went to Niagara Falls, the destination for many honeymooners in the 1940s. Farmer shoes in a wedding photo? Perhaps that’s what people 100 years from now will say about the wedding photos I see with tennis shoes, or barefeet, or whatever. Indeed, whatever! Do shoes matter? What stories about our times our photos tell, that we often don’t stop to analyze. Thanks for the moment, Marian. I noticed the scuffy shoes too, Melodie. He had enough money to buy dress shoes or get these shoes polished. When they married, Grandpa was about 15 years older than his bride and well established at age 40+. Back then it was important for a man to be able to support this wife before marriage. He sold cars, Model A and Model T Fords and then began H. R. Longenecker & Son, farm equipment dealership. Oh yes. I was also struck by the glimmer of a smile on both their faces. They actually look happy. 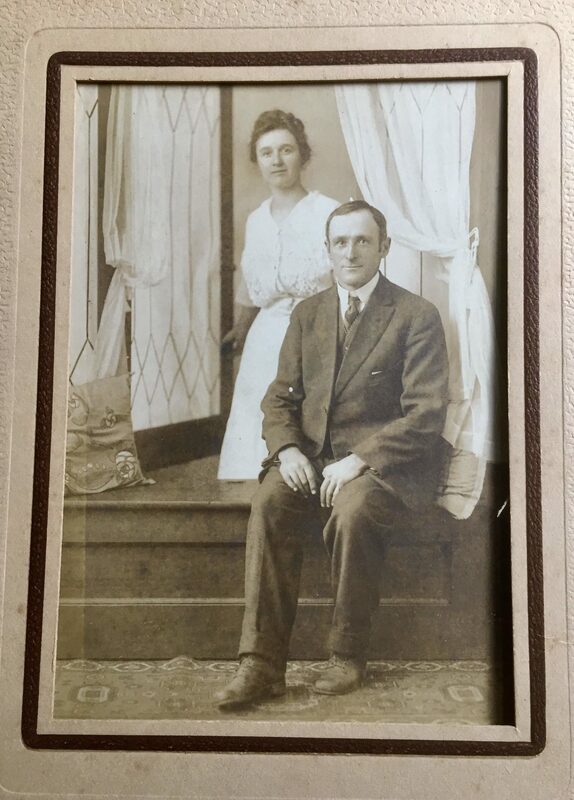 I have one of my maternal great-grandparents, dated 1902. They look like they’d like to kill each other. I’m amazed how readers are noting the smiles, even faint ones. Compared to my own wedding picture, this couple looks (to me) nonplussed. Your comment about your great grandparents’ expressions makes me wonder whether the photographer, not the bride and groom, was at fault. I guess you’ll have to do some more investigating about their relationship. Thanks, Janet. I didn’t realize she was kneeling. I thought she was climbing in through an open window and that’s why they had suppressed laughterr on their faces–that is usually what the men did! If she’s kneeling behind him, that’s another whole scenario! Elfrieda, your comment about my grandma-bride climbing in through an open window sounded preposterous to me – that is, until I noticed her hand was on the window frame. Aha! Golly, Pam, I’m certainly glad I asked this question here. The wedding picture seemed like a dud of a wedding portrait when I first saw it. All I could see initially were the sober faces and Grandma kneeling (subserviently) behind Grandpa. How well I know – from your blog and books! Marian — I like that the photo was taken with the window as their setting. It’s seems really “progressive” (hip and happenin’) for that era! As to their expressions… they’re both wearing “I know something you don’t know” looks on their faces. I’ll never look at this portrait the same way again. You and other commenters have taught me to see the photo with a different pair of eyes now. Thanks, Laurie! Yes, I’d like a closer look at the dress – and her shoes. If this photo were taken today, the couple would be side by side, or possibly the bride in front. Certainly no modern-day bride would agree with the idea of kneeling. I know I wouldn’t. Thanks for weighing in here, Carol! I have never seen a photo from that time look so relaxed . It looks like there is a lot of humour in their marriage ( I presume they are married here) . I think if you were able to scratch the surface, underneath would be a riot of colour . Those naughty pixels and electrons can’t keep our connection broken forever. Thanks for making the effort to re-connect here, Cherry. Hi Marian lovely to be back . I think when I said a riot of colour I meant metaphoricallly speaking . You know this lovely lady and gentleman better than me obviously . It ‘s just how I perceived them in my mind’s eye . Ha Ha, Cherry. Got it! I agree, Debby. The bride, my vivacious grandmother, seems to be depicted here almost as a after-thought, the groom appearing front and center of attention. What was the photographer thinking, I wonder, a gentleman from Harrisburg, Pennsylvania, no doubt. I agree with Debbie. It’s a very formal photo as was the deal back then. But I’m sure they were happy together!! As a turn-of-the century couple, they had clearly delineated tracks: Grandma took care of things on the home-front and Grandpa tended to business. My sister Jan interviewed G’ma for a sociology class she took and Grandma remarked that when they disagreed sometimes their arguments got heated but when it was all over, “That was the end of that,” she said. Apparently no grudges. He was strong, silent type – she was gregarious, I guess a good match. Unique positioning for a wedding photo. I wonder if that was the photographer’s idea. She looks as though she might push that window open and fly. Although she’s kneeling, her position above him and taller than him makes me think that at home, she held her own. He also has a slightly meek expression and gentle hands. Your reading of the photo is closer to reality than most, if my sister’s interview with Grandma for a sociology class is any clue. Yes, at home she was “in charge” and the shop was Henry’s domain. Apart in age by nearly 15 years, I sensed that they were a decent match – at least their personalities were complementary, not clashing. Now I’ll have another look at his hands, thanks to you, Elaine. They look to be expressing a conservative (smile) happiness! Love old photos. Oh, Ann. Thanks for popping up here. They were both conservatives in every shape and form. Depression people, they never threw anything away. Even Smiles! Love and blessings to you and yours.